Michelle Williams appeared as a guest co-host on Thursday’s episode of ‘The View‘ and defended friend and fellow Destiny’s Child group member Beyonce against comments from former Arkansas governor Mike Huckabee! Grammy Award-winning singer Michelle Williams shared co-hosting duties with the ladies of ‘The View‘ on Thursday where presidential hopeful and former Arkansas governor Mike Huckabee was one of the show’s guests. Huckabee is the author of God, Guns, Grits, and Gravy in which he attacks global superstar performer and Williams’ fellow Destiny’s Child group member Beyonce for the sexually assertive songs included on her self-titled visual album. 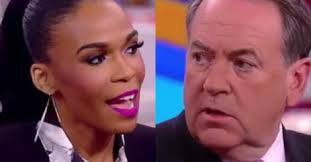 Watch the brief interaction between Williams and Huckabee below and don’t forget to post your thoughts on this in the comments section!